I grew up just a few blocks from the Burhop family in Glenview, and my mother, a friend of Vern and Janis Burhop, would call Vern at the State St. store and he would bring home her seafood order, even dropping it off at our house. I only remember going to the State St. store once as a child, when I thought it seemed very big and the men in white coats and brimmed hats behind the counter seemed quite intimidating. In the 1970s, when I started dating Jeff Burhop, he took me down to see the State St. location, both in the front retail space, and in back, where the thousands of pounds of wholesale seafood was moving in and out. Whole tuna, giant turbot, cases of shrimp and lobster tails. I loved it -- it was amazingly Dickensian, a mostly wooden building, with each room on a different level, making it hard to move things around except through human muscle power. There was a fleet of green and white Burhop delivery trucks that parked outside, and virtually every restaurant in town, if you asked where they got their fish, would say Burhop's, even if they didn't. Known for their quality and honesty, everyone wanted to claim that their fish was the best, hence from Burhop's. The owners of the building, the American Medical Assoc., also rented out the top floor of the building to a health club. With great regularity, someone up there would leave the showers on until there was a flood and water would come through Burhop's ceiling, causing enormous, expensive damage. Burhop's had to take them to court to get repairs done, and finally the AMA made the decision to sell the building. That area of Chicago was getting more and more built up, and it was assumed that the new owners would tear down the old building, so Burhop's had to move. A new location for the wholesale was found near Elston Ave., much newer and far less interesting, but easier to keep clean. What was Burhop's for about 50 years became the Weber Grill Restaurant. The retail store was moved to the corner of LaSalle and Chicago, and was dubbed One Fish Plaza. By this time, Vern had retired very quickly, because of health issues, and two new partners bought him out, joining forces with Jeff and his brother Jim. This became a period of extreme change -- the new partners, one a lawyer, the other in real estate, had grand ideas but little experience in seafood, retail or wholesale. Jeff and Jim, who had the experience, were basically not consulted or their advice was ignored about many of the changes that the new partners made, and the result, along with other influencing factors, was the closing of the wholesale side of the business. Many restaurants went out of business owing Burhop's large sums of money for seafood, and then the owners would open a new restaurant a block away and want Burhop's to deliver fish. Competitors would sell fillets of west coast flounder which they were able to sell very cheaply, and call it genuine Dover sole. Chefs who should have known better were fooled. Too much money was being lost, so Burhop's wholesale was shuttered, and the focus was put on expanding the retail. Up to seven retail locations by the mid 80s, the decisions made by the new partners came back to bite us. A couple of the locations turned out to be extremely bad choices, and were shuttered after sizable losses. One Fish Plaza was closed after the building was sold, leaving Burhop's with no Chicago store for the first time in almost 60 years. Two more of the suburban stores closed, leaving Glenview, Wilmette, Hinsdale and Highland Park. The Highland Park store, in an out-of-the-way location, closed, and then the remaining three stores were sold to pay outstanding debt. Jeff had left the company a year before it was sold, his brother after the sale. Glenview and Hinsdale were bought by a former Burhop's employee, Phil Kulin, and Wilmette was purchased by the owner of the Plaza del Lago shopping center, Joe Moss. Two years later, Jeff put together a deal to buy back Hinsdale and Glenview, which he owned until the Glenview store was closed last September. The extremely high rent was just too much to make the store successful. The last family owned store, located in Hinsdale is now for sale, as there is no one in the family to take it over. 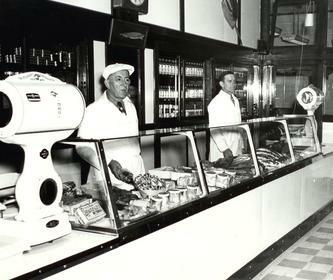 For 90 years, Burhop's has stood out as the premier purveyor of fine seafood in the Chicago area -- as we look to retire, we hope to find someone who can continue the legacy. We have loved going to seafood shows and visiting wineries and wine tastings, meeting our many "foodie" customers, and enjoying the best seafood in the Chicago area in our own dining room. There is much to commend being in the seafood business!